Industry standard. Showcased in some of the most elite clientele in the world. To stretch or not to stretch? You decide. Behold Teleios sleeve. The top choice for any level of sleever since 2013. Months of development went into crafting the ideal sleeve for beginners just getting into the hobby, to professionals who demand the utmost quality to reflect their project. Teleios sleeve embodies the core components needed to achieve this feat. To start, PET filaments are tightly wound together to create its circular shape. So tight that it is very difficult to see through the material without it even being stretched. 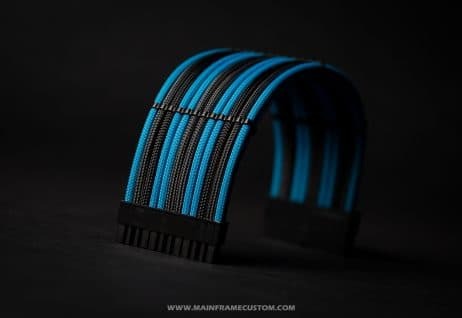 This creates a natural barrier from being able to see the wire underneath the sleeve which is the main goal when sleeving your cables. Furthermore, the sleeve holds its tight weave even when the sleeve is bent, or for example placed around sharp corners. Other sleeve types will fray apart unveiling the wire underneath especially those of larger diameters. We developed Teleios sleeve with this in mind and found 4mm is the perfect blend of size and pliability. What makes a sleeve great if it is not easy to use? A great sleeve needs to be easy to use. This implies that beginners will not have issues using the sleeve, or that the technique can be picked up easily. Both of which Teleios sleeve delivers on. Some sleeve types are catered towards the more experienced leaving the beginners feeling frustrated and eventually give up. 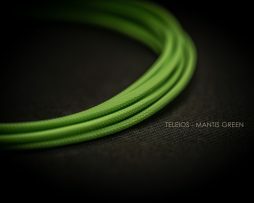 Sleeving with Teleios is as easy as pulling the sleeve over the wire, and melt. Teleios sleeve has been used alongside some of the industry leading technology companies in the world to showcase their new products. 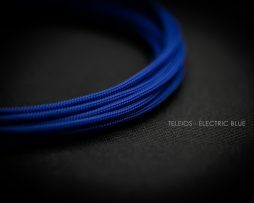 From NVIDIA to award winning producers such as Deadmau5 to name a few, Teleios sleeve was used in sleeving the power supplies that powered their new tech. We have been fortunate to be brought alongside in creating these beautifully crafted cables for their projects many of which can be found all over the internet. 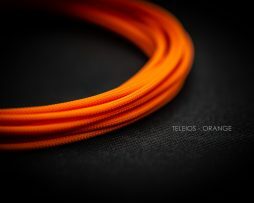 Without a doubt what makes Teleios sleeve so easy to sleeve with is its ability to deliver great coverage on a wire with, or without stretching the sleeve much at all. There are not many if any other sleeve types out there that give you this ability. This plays an important role when measuring, and ultimately melting the sleeve to the wire. Other sleeve types tend to need to be stretched in order for the PET filaments to close together. This becomes an issue when the user must then hold the sleeve while trying to melt the ends of the sleeve to the wire. The sleeve will then try to pull back from the sleever making it difficult to melt properly and ultimately giving you undesirable results. Teleios sleeve is easy to stretch if you would like and if so doesn’t need to be stretched much to give you an unsurpassed level of coverage over your wire. Another ingredient to give you professional results? Having a low melting temperature. A low melting temperature means that the sleeve will melt at a low temperature, or doesn’t need a long time over a flame to melt. What does this mean to you as a sleever? An easier to sleeve to control and be able to tack to the wire without issues. Sleeving that requires long melting times tend to burn and discolor which ultimately render the sleeve unusable. Vice-versa have a sleeve that has too low of a melting temperature and has it melt too fast making it difficult to control. We developed Teleios sleeve to have best of both worlds, a low melting temperature that is easy to control. 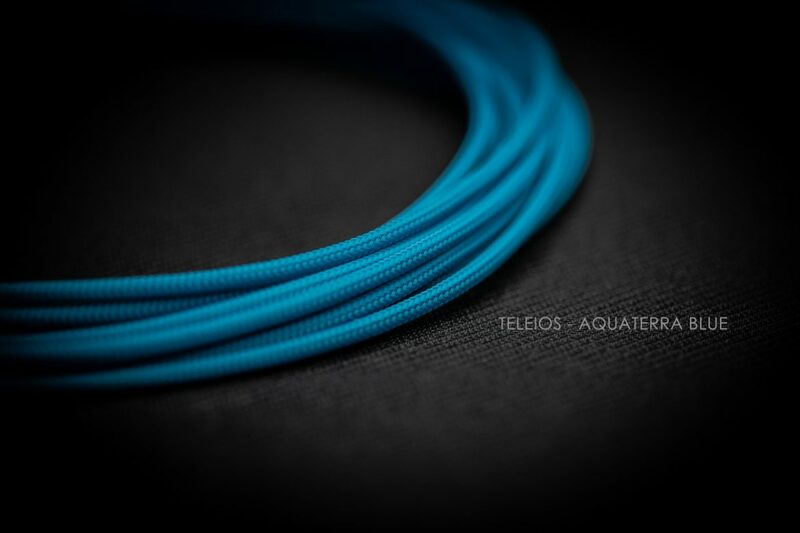 However, that is not to say that Teleios sleeve will melt when over your wire. Teleios sleeve is very robust and can withstand high temperatures within an environment. This is just in the sleeving process when a flame is needed to melt the ends on the wire. 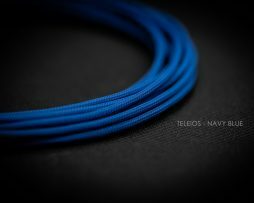 Whether you are just getting into the hobby or already an avid sleever, Teleios sleeve makes it easy to achieve the finishing touches to your computer that make it stand out above the rest. How long does the sleeve come? Sleeve is sold in 25ft quantities. Any quantity over 1 will come in one continuous piece. How much sleeve do I need? If you are making extensions 100ft should be sufice (based on 1ft extensions). For full cable replacement, it is recommended 250ft. What heatshrink should I use to melt the sleeving? 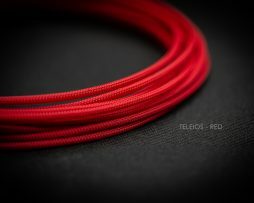 What is Teleios sleeve diameter? 4mm, but we also sell Teleios in 8mm SATA too!